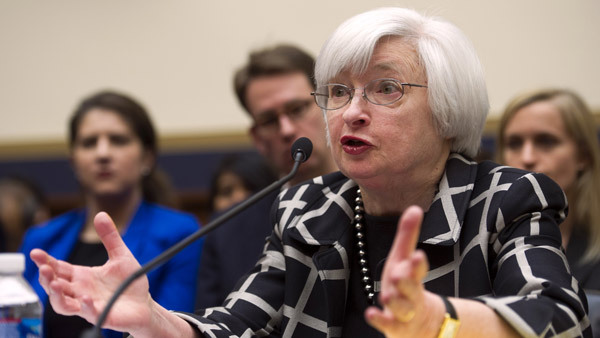 Some central bankers say they are in a 'wait and see mode' when it comes to policy-setting. Go ahead, Federal Reserve, keep trying to prepare markets for an interest-rate increase this year. The longer U.S. central bankers wait to initiate their tightening cycle, the more traders push back their expectations for when borrowing costs will start rising. On Thursday, futures contracts were implying that traders saw the fed funds rate at about 0.3 percent rate by December. That’s the lowest estimate of the year, and about half the forecast for the overnight lending benchmark that the Fed gave in March. The market is essentially calling the Fed’s bluff. Traders are betting that policy makers won’t be able to raise rates this year without disrupting stocks and bonds, something that they’d really rather not do. So either U.S. policy makers will have to risk another market-wide tantrum, or they’ll give in to traders who embrace the idea of these historically low borrowing costs sticking around for longer. In the meantime, Fed members are amping up their rhetoric that yes, a rate hike is coming, yes, it’ll probably be this year, and no, it may not be an easy ride for markets. Liftoff “feels most probable somewhere in the late summer than the early summer, but early summer is not out of the question,” David Altig, research head at the Federal Reserve Bank of Atlanta, said in an interview in Madrid on Wednesday. A day earlier, Federal Reserve Bank of San Francisco President John Williams said the U.S. central bank could decide to begin raising interest rates at any policy meeting, and that he is in “wait and see mode” headed into the next gathering in June. The New York Fed’s William C. Dudley had some starker words for traders that same day: when central bankers make their move, they’ll usher in a “regime shift” that will stir markets. Dudley, who is vice chairman of the policy-setting Federal Open Market Committee, said the timing of a hike is uncertain. While the U.S. economy is showing signs of recovery after more than six years of unprecedented Fed stimulus, some of the economic data keeps disappointing. One of the latest examples is retail sales that barely budged in April, confounding analyst projections for a small increase. As the unemployment rate has fallen to 5.4 percent from as high as 10 percent in 2009, workers still aren’t earning materially bigger paychecks or returning to their erstwhile spendthrift ways. While the global bond market has lost hundreds of billions of dollars in May, short-term debt yields haven’t changed much – - another sign investors don’t expect the Fed to end the stimulus party anytime soon. Yields on 2-year Treasuries have fallen to 0.55 percent from 0.57 percent on April 30. Fed members can keep warning traders of shocks that are soon to come, but a lot of folks just aren’t buying it.